A first for the Association! To reserve your cabin for this great family reunion, please fill out this form and Alisen from Sunward Adventures will call and confirm your space on the ship and the group. You can also contact Alisen at Alisen@sunward.com, or call the office at 800-786-9273 x109. Or call Alisen's cell phone at 775-790-2612. Travel & Cancellation Insurance is available - ask Alisen when making your reservations. To experience the real Alaska, come to where the mountains are taller, the rivers mightier and the wildlife more plentiful than any place on earth. This is cruising Alaska. A rugged, untamed wilderness where the forests go on forever and the summer days never end. Alaska is a pristine wilderness of ice-blue glaciers, snow-capped mountain peaks and huge whales breaking the surface of crystalline waters. The configuration of Accessible Staterooms may vary from the non-accessible staterooms shown here. Approximately 151-233 sq.ft. 2 lower beds convertible to 1 queen-size bed, shower. Approximately 174 - 180 sq. ft. 2 lower beds convertible to 1 queen-size bed, bathtub, shower. Approximately 212 - 359 sq. ft. including verandah. 2 lower beds convertible to 1 queen-size bed, bathtub, shower, sitting area, private verandah, floor-to-ceiling windows. Approximately 372 - 384 sq. ft. including verandah. 2 lower beds convertible to 1 queen-size bed, bathroom with dual sink vanity, full-size whirlpool bath, shower and additional shower stall, large sitting area, private verandah, 1 sofa bed for 1 person, floor-to-ceiling windows. Every day aboard a Holland America Line cruise ship brings a wealth of onboard cruise activities and new things to do, along with the freedom to partake in as many — or as few — as you please. It's an opportunity to try something new that surprises you, every day. Dabble, discover, daydream — do everything, or do nothing at all. Whether you want to workout in the Fitness Center, learn yoga, pamper yourself with a massage and spa treatment, or listen to music and check your email in the Explorations Café, there's a perfect onboard activity for everyone. Direct from Beale Street, our B.B. King All-Star band brings the best of Memphis music to sea. From funky and fast to soulful and smooth, the band does it all while you enjoy a signature drink or dance the blues away. B.B. King Blues Club — it’s good for your soul. Of all the fascinating places you can visit on a Holland America Line cruise ship, none rejuvenates and relaxes like the Greenhouse Spa & Salon, featuring heavenly beauty and wellness rituals. Choose the blissful pampering of a facial therapy or let the trained fingers of a massage therapist soothe your muscles while working fragrant oils into your skin. Enjoy therapeutic water treatments as you steam in a thermal suite or bathe in herbs, all the while cruising to exotic destinations and enjoying the indulgences that are a signature feature of luxurious Holland America Line cruises. Heated ceramic lounge reminiscent of an opulent Turkish bath except ms Prinsendam. Unleash your inner chef and learn new culinary skills alongside our award-winning chefs and culinary guests. Some of the world’s leading culinary experts will join us on board for live cooking shows, book signings and special menu offerings. Delight your palate with innovative food and wine pairings handcrafted by visiting vintners and our own Holland America Line cellarmasters. On selected cruises, take home Food & Wine® recipe cards and wine tasting notes along with copies of the magazine. Discover the secrets and unique traditions of regional cuisine, from the flavors of Alaska to pasta making in the Mediterranean. Local market tours are available in selected ports of call. Each program can be viewed from the comfort of your stateroom via broadcast. In conjunction with the Holland America Line Beverage team the Culinary Art Center offers a Signature Cocktail program where guests can learn how to prepare world class cocktails from one of the ship’s bartenders. 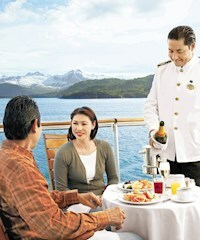 Wine tastings hosted by the Cellar Master and Party Planner are also available on every cruise. You can enjoy two different tasting levels – Navigator Wine Tasting or Premium Wine Tasting. Alaska's capital can't be reached by road. You fly or sail here to enjoy its greeting of dockside flags and flowers. It is surprisingly urban and cultured for being so remote. Visit the museum for insights into Inuit culture and crafts. Drive up to Mendenhall, the only glacier inside city limits! Or get an aerial view from a helicopter. Fish for silver salmon, or just enjoy some off the grill --then kick back at the Red Dog Saloon.No roads lead to Juneau, which gives the Alaskan capital a misty inscrutability. You need to come by air or water, but when you arrive, the place will delight you with its bounty of water, forests, and mountains. Squeezed between the Gastineau Channel and Coast Mountains, Juneau offers a lot of variety in close proximity. The massive Mendenhall Glacier and the immense Juneau Icefields are at its back door. The vast Tongass National Forest stretches away to the northeast. You can shop downtown or get out and kayak, dogsled, raft, hike, whale watch or fish. The adventures are as bountiful as the daylight. Preserved as a National Monument, Glacier Bay is an extraordinary collection of glaciers in a contained region. Only two ships per day are permitted to enter the bay during the summer months, when whales come here to feed. 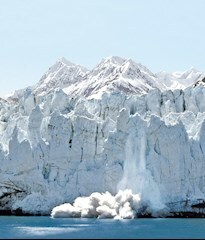 The ice in Glacier Bay fell as snow, hundreds of years ago, on the ice fields in the mountains above. Compressed by its own tremendous weight, it slowly flows through valleys to the sea, where in some cases it breaks off in great chunks called calves, to float free as icebergs and "bergy bits"
When Alaska belonged to Russia, Sitka was the capital and center for its fur trading empire. Today, Sitka's a Russian heritage and magnificent setting make it an enchanting destination. The city features a harbor studded with islands, a backdrop of mountains and spectacular Mt. Edgecumbe, a volcano often compared to Japan's Mt. Fuji. Sitka displays its past in such attractions as St. Michael's Cathedral with its striking onion-shaped dome, the Russian Blockhouse, and world famous New Archangel Dancers. Visit the Historic Park, with a ruined Indian fort where Tingit Indians battled Russian settlers in 1604. Ketchikan is the salmon capital of the world. The canneries are busy, and the stream below Creek Street's rustic boardwalk bustles with life. Visit the ancient grove of Totem Bright, the largest collection of authentic totem poles anywhere. make a flight to nearby Misty Fjords-- a breathtaking vista of Alaska's unspoiled wilderness and America's newest national monument, or, try a little salmon fishing. Hello, England. Fancy meeting you here! Victoria is a city that started as Salish Village, spent a roustabout adolescence as a main port for gold prospectors and opium traders, and then transformed itself into an icon of British gentility after the completion of the trans-Canada railroad put neighboring Vancouver in the ascendant. Two events were seminal: the opening of Butchart Gardens in 1904 and the completion of the Empress Hotel in 1908. Butchart is a collection of gardens more than a single garden -- highlights for cruise visitors include the Sunken Garden (built from a former limestone quarry), the Italian Garden, the Japanese Garden, and the Rose Garden (breathe deeply). The Empress Hotel is merely a national icon. Come in for high tea. Guests on Westerdam will be able to "show and tell" their vacation memories through the Digital Workshop powered by Windows®. Free workshops led by Microsoft-trained "techsperts" will show even the most novice camera or computer user how to take better vacation photos, make movies, edit pictures and create scrapbooks using a variety of Microsoft Windows and Windows Live services. Guests will learn how to share all their digital memories through email, blogging and social networking — so friends and family can see where they've been cruising even before they return home. Join us aboard Westerdam as we explore Alaska. Should you want to look at the current brochure from Holland America and Alaska cruises please click here. In addition to the theme cruises, all the cruise ships in the Holland America Line fleet will feature exclusive Dancing with the Stars: At Sea dance lessons developed by the show's professionals and lead by the onboard dance team. Select cruise guests from these classes will be invited to dance center stage in the show lounge in an exciting dance-off performance. Whether you are an experienced gambler or rolling dice for the first time, our Casino offers a variety of games for all levels as well as complimentary lessons from our friendly dealers and tournaments for veteran players. Table Games — Play Blackjack, Roulette, Craps (select ships), Three Card Poker, Let it Ride (select ships), Texas Hold ‘Em and more. Slots — From penny to five-dollar machines and multi-denomination games, plus video poker, we’ve got the game for you. You’ll find slot favorites such as Wolf Run, Wheel of Fortune, Aruze "The Gold", Bally Quick Hits and many more! Bonus spins and progressive jackpots add excitement for players. Cruise Lottery — Guests on all ships can play the cruise lottery for a chance to win a 7- day cruise. Scratch tickets are now on sale — Choose from $1 to $20 tickets — you could win up to $100,000! Tournaments — Join in the fun of a Slot or Blackjack tournament for that extra chance to win big. Show your poker face during one of our exciting Texas Hold'em Poker tournaments. Giant LED screen on deck for open-air movies. Available on select ships.